In a massive light flyweight unification bout tonight at Coliseo Mario Morales in Guaynabo, Puerto Rico, local legend Ivan Calderon was shocked by opponent Giovanni Segura. At 35, WBO champion Calderon was coming off four straight defenses in which he either could not finish the bout due to head clash injuries or had to climb off the canvas and tonight the southpaw's good luck ran out. 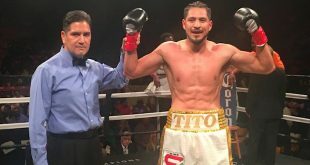 Challenging Calderon was American based Mexican WBA beltholder Segura, who had toiled in the shadows before winning the title a year ago and making a defense in February. Seven years younger than Calderon at 28, Segura had danger written all over him coming into this contest, having stopped all but four of his 24 victims against only one career loss. Having never tasted the sting of defeat over the course of a pro career that spanned almost 10 years and 19 world title bouts over two weight classes, Calderon started off confident, sweeping the first half of the clash behind his trademark superior southpaw skills. 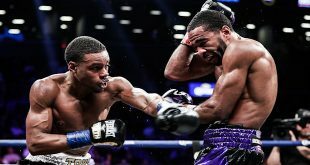 But "Iron Boy" just didn't have the punch to keep Segura at bay, nor could the seemingly ageless Guaynabo man outwork his younger, bigger and stronger antagonist. 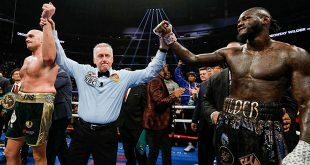 The aggressive Segura made Calderon work very hard in dealing with the applied pressure and the strategy paid off when the WBO champ tired and was forced to stand and trade. This turn of events proved disastrous for Caleron, who was losing exchanges with ever increasing frequency until Segura landed a spearing body punch in the eighth that floored Calderon for the full count at 1:34 of the round. Segura adds the WBO crown to the WBA bauble in his trophy cabinet while improving to 25-1-1 (21). Calderon's streak of no losses comes to a crashing halt as he falls to 34-1-1 (6). Segura now sits atop the light flyweight division with just WBC champ Omar Nino Romero and IBF ruler Luis Alberto Lazarte standing in his way.